Are you searching for the perfect Halloween décor idea this year? Why not choose something quite traditional and take some inspiration from something we’re all quite familiar with? We think this would make a great idea to base your Halloween decorations on! When we think of haunted houses we think spooky ghosts, vampires, ghouls and eerie noises, so why not bring these ideas to your home or party venue this year with a little help from Halloween Horror Shop?! Why not add something impressive to the outside of your home to welcome your party guests and trick or treaters to your haunted house, just like our Dracula Halloween Inflatable. This self-inflating decoration looks fantastic at night as it is lit by LEDs inside, and we adds the perfect spooky atmosphere for both kids and adults! We think our Evil Stack of Skulls will be the perfect item to decorate your front doorway of your haunted house, giving guests a scare as they enter your home. Each skull has built in spooky red eyes and emits an evil laughing sound. We think this will be a hit with all your party guests and trick or treaters! Another way you can add a scary mood to your windows and doorways is with our Creepy Spider Web Decoration. Perfect for spreading across walls, doorways and windows, the more you separate this spider web out the more realistic it looks! 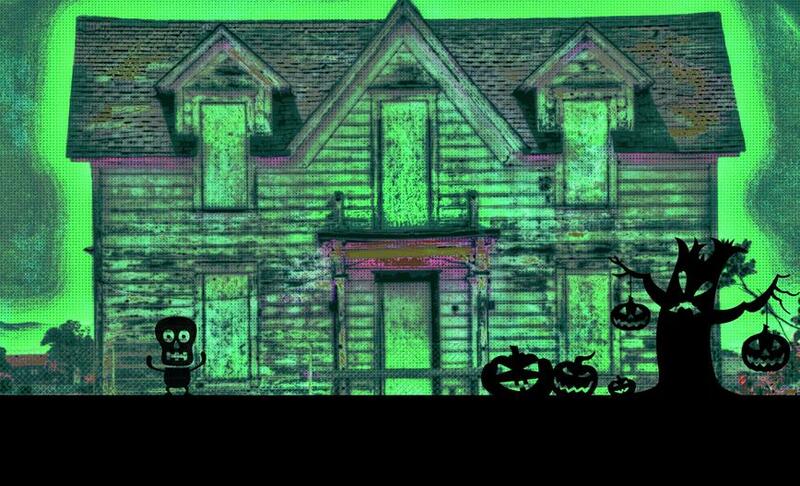 This will really help to transform your home into an old spooky house giving it the perfect haunted house atmosphere. Perfect for hanging in corridors, our Lady in Frame Horror Picture will be ideal for giving all your guests a scare as they pass by. This will certainly keep everyone on their toes as it is sensor operated and will light up with spooky red eyes when set off. This decoration is ideal for Halloween parties! Add some eerie lighting to your haunted house with our fantastic range of Lighting. Whether you’re looking for string lights, candles, lanterns or more, you’ll find a great selection on our website. We think this antique looking 3 Tier Candelabra is absolutely perfect for creating a haunted house theme this year, it could be taken from Dracula’s lair itself! Including 3 flickering candles to stand on your frame, when all the lights are off the realistic flickering of these candles will make a super spooky atmosphere! There’s the added advantage when using artificial candles that you don’t have to worry about leaving these unattended, as this safe alternative has no risk of fire yet still looks like the real thing! How about adding one of our colourful scary Lanterns to your décor, perfect for placing in window displays, on table tops or shelves. Choose your favourite design or why not collect them all and place in different rooms, to keep the spooky theme running through all areas of the home. What would a haunted house be without at least one skeleton?! Place our Spooky Realistic Hanging Skeleton anywhere in the home for an easy way to instantly create a creepy vibe! Another traditional decoration for a haunted house would be our Hanging Halloween Bat. Wherever ghouls and vampires hang, you’re sure to find creepy bats too! Our Halloween bat has spooky red eyes so can even be seen in the dark! Why not collect multiple bats and place them all around the home. The bat is sound activated so guaranteed to give your guests a fright as they pass by! Another of our great Halloween Props for the inside of your haunted house is our Animated Halloween Tombstone. Perfect for creating a freaky mood in the home, the grim reaper makes a terrifying experience from behind the tombstone and with its bright red eyes and scary laughing sound, it is a fantastic décor option for the night time! Guaranteed to give everyone a fright this Halloween! We hope this handful of decorations will inspire you when choosing which décor theme to go with this Halloween. A haunted house is a perfect, traditional theme that will work for all homes, and is ideal for whether you’re decorating a whole party venue or your own home. Check out all these products and many more on our Halloween Horror Shop website, and don’t forget you can grab a real bargain this year as our fantastic 50% sale is still on!